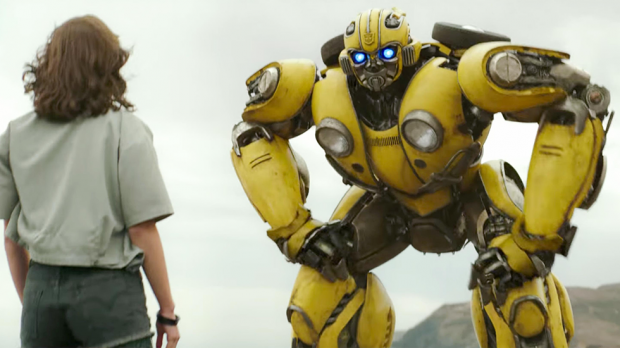 The latest trailer for Bumblebee gives a lot for the fans to look forward to. Travis Knight’s new film looks to take its design nods from original Generation One of Transformers rather than Michael Bay’s films, and this latest trailer has given us more than a few G1 Transformers to admire. Set in 1987, this is setting itself up as an origin tale for Bumblebee, who is sporting the character’s classic VW Beetle look. Haliee Steinfeld (Edge of Seventeen) seems to be killing it as the teen alternative now saddled with a robot fugitive (rather than her first set of wheels), and we get our first peek at John Cena’s Agent Burns. However it’s always about the robots, and we’re shown a few glimpses of the old stable of classic G1 Transformers in what looks to be the final days of Cybertron. Shockwave, Soundwave, Ravage, Optimus Prime (voiced by Peter Cullen),and what looks to be Ramjet, Dirge and Thrust. Not to mention a good look at the new Decepticons on the block, Dropkick (Justin Theroux) and Shatter (Angela Bassett). That unfamiliar sensation you are experiencing is hope that this might actually be a good Transformers film. Yeah I’m not familiar with it either.